On the first day of high school a beautiful girl named Haruhi Suzumiya introduces herself as having “no interest in ordinary humans”. She asks for any aliens, time travelers, sliders or espers to join her. Watching her weird behaviour is Kyon who sits in front of Haruhi and is the only person who talks to her. When Kyon comments about Haruhi’s joining every club in school and then quitting he unwittingly gives Haruhi an idea to start her own after school club. 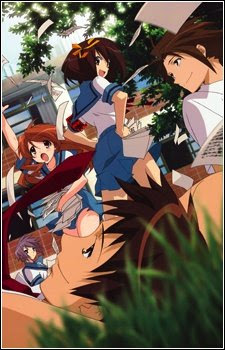 Thereafter Kyon and several others find themselves dragged, literally, into the Save our world by Overloading it with fun Suzumiya Haruhi’s Brigade (the S.O.S. Brigade for short).